Recycling is considered the best way to save water, so it may seem natural to use it in your pool. However, recycled water isn’t recommended for swimming pools, because it comes in direct contact with your skin. A more effective solution is routine pool maintenance. Check your pool for leaks and fix them immediately. Leaks waste up to 7,000 litres of water. The quickest way to spot a leak is to observe the speed of water loss. Put a bucket in your swimming pool step. Place a rock or brick inside the bucket, to make sure the lapping water doesn’t tip it over or drag it away. Fill the bucket to the same level as the rest of the pool, marking the level with a marker pen or masking tape. Leave it there for a week or so, then check the level. Both the bucket and the pool will lose water through evaporation, so the level should subside. However, if the bucket level is much higher than the swimming pool level, you probably leak. The natural assumption for many swimming pool owners is that under-filling the pool saves water. The opposite is true. When there isn’t enough water in the swimming pool, buoyancy is reduced, which means swimmers use more energy to stay afloat. As a result, they splash about more, and more significant volumes of water get displaced from the pool and wasted. Low water levels can also damage pool equipment. If the pump or filter are exposed, they might short circuit, leading to expensive repairs. At the other extreme, over-filling the pool leads to water loss when the pool overflows. This can happen every time a swimmer, jumps, dives, or moves in the pool. The water skimmer should always have water halfway up, and this is an excellent way to check the water level at a glance. The skimmer basket collects leaves, sticks, and more extensive pieces of debris. Clean and empty it once a week. If you do it more often, then more water will seep through than is necessary, and this can lead to excessive water wastage. Many pool owners enjoy gazing at their swimming pools, even when they’re not swimming. The sight and sound of the water can be quite soothing, especially on a warm evening under the stars. However, leaving the pool exposed continuously has two potential pitfalls. One, it leads to unnecessary evaporation and water loss. Two, it allows additional dirt and debris to fall into the pool, which will then require cleaning. This cleaning leads to water being wasted, either by the filtration process of by manual skimming and vacuuming. 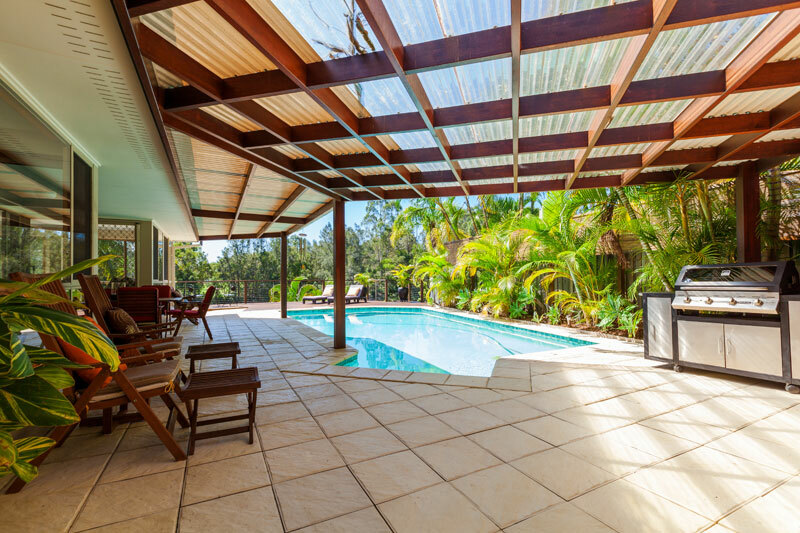 Invest in a good pool cover that enhances your pool design. Choose that is easy to clean and install. Pool covers are an essential piece of equipment if you regularly heat your pool. The rise in pool temperature makes it more susceptible to evaporation, and the protection minimises this. Covering the pool has the added benefit of regulating the pool temperature. This way, you can lower your heating costs. Buy a roller cover, since it’s easier to use and maintain. For more advice on how to save water in your swimming pool, or to buy an affordable, beautifully designed, environmentally friendly pool, call Blue Haven on 13 20 25 today.